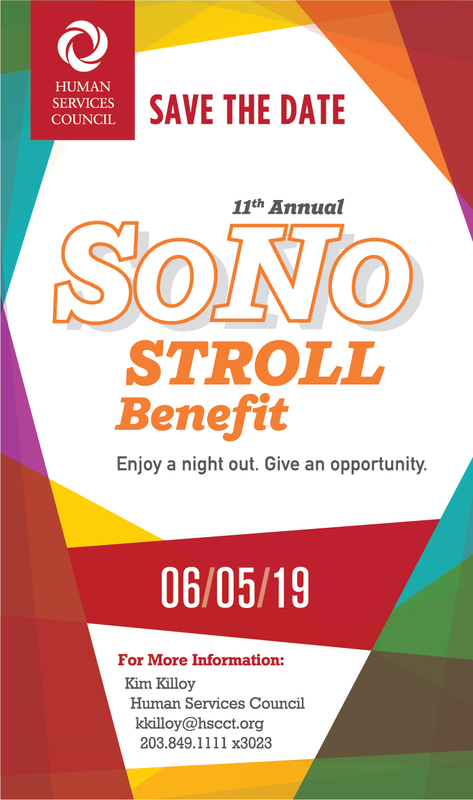 Please join us on June 5, 2019 for the 11th Annual SoNo Stroll Benefit! The SoNo Stroll Benefit is the Human Services Council’s signature fundraising event. In its eleventh year, the Stroll has become the biggest and most successful fundraiser that benefits the Human Services Council. The SoNo Stroll kicks off at 5:30 p.m. at Mora Mora, 17 Washington Street, South Norwalk, where a cocktail reception will take place, along with live and silent auctions. Following the reception and auctions, guests partake in a three-course meal at one of the event’s participating SoNo restaurants. They are: Beach House SoNo, El Segundo, Evaritos Mexican Kitchen, Harlan Publick, Match, O’Neill’s Irish Pub, Saltwater SoNo, The Spread, Tablao and Washington Prime! Enjoy a night out and empower your community!